The Missoni exhibition at the London Fashion and Textile Museum promises 60 years of textile design showcased alongside 20th century art masterpieces. Much of the art comes from Italian galleries and private collections and has never before been shown in the UK. “Let colour and rhythm dominate”: the exhibition certainly does, from the frenzied patterns of the huge 70s wall hangings to the disorientating light installation. In the central room of the show catwalk-esque spotlights flash periodically on and off, illuminating forty mannequins wearing Missoni designs. These mannequins are the centrepiece of the show, displayed on a tiered diagonal that mimics the bias cut of a fabric, or the chevrons on a Missoni dress. They show forty iconic looks from Missoni’s collections: we have the knitted bathing suit and the ever-so-slightly more practical knitted suit. The clothing is beautiful, the patterning of the wool revolutionary for its time, and its displayed as an aesthetically harmonious whole. 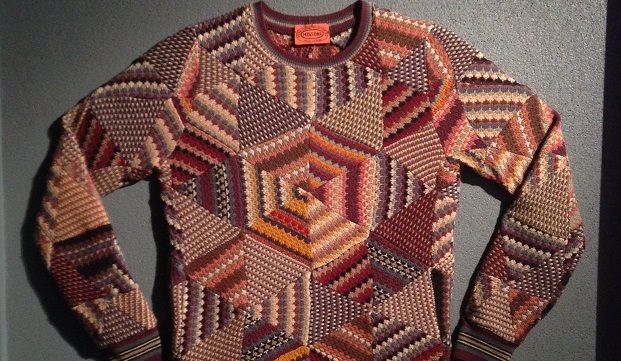 This exhibition does not set out to show Missoni’s style evolution, or show how collections move between themes. Missoni fashion is presented as a body of consistent work that is firmly rooted in Italian mid-century Modernism. Leading up to and away from the central mannequin display, the walls are lined with works that take us on a journey through Italian concrete, abstract and conceptual art, with pattern at its heart. This is a multimedia show of sculpture, film, clothes, textiles, light installations as well as traditional oils. It is sometimes a stretch to equate fashion design with modern art but the exhibition works hard to draw parallels between the two, exhibiting a number of Ottavio Missoni’s inspirations. Ultimately, it’s not the clothes themselves but Missoni’s fabric swatches and pencil drawings that come closest to mirroring the Italian abstract art on display here. Ottavio Missoni was also an artist, and there are a number of his own acrylic works on show - they look a bit like London Underground posters but they fit well thematically alongside other works of Italian modern art. However, his art is not as visually stimulating as the clothes, or the giant wall hangings that cushion the space around the main room. Sonia Delaunay, one of Ottavio Missoni’s favourite artists, is represented here by two of her smaller works. There are larger, textured oils from the concrete art movement and a very nice colourful oil by Nino Salvadori, ‘Spatial structure in tension’. Another famous influence, Lucio Fontana, has two canvases on display. Fontana is notorious for slashing his canvases- you can see a larger one in the Tate permanent collection- but it is hard to see how his dramatic conceptual work relates to Missoni here. The final room, The Missoni Room, offers an immersive experience of Missoni textures in the museum’s fashion studio, with mirrors and jazzy fabric providing a fitting tribute to the brand. This exhibition was originally shown in Milan in 2015 and was twice as large, with over 100 works and 100 outfits. It is a shame that only a scaled-down version fits into the Textile Museum space. Scaled down or no, a Missoni exhibition was always going to be a visual feast- a proliferation of photogenic, colourful art and fashion. For fashion lovers wanting wardrobe inspiration, it’s well worth a trip.